I went for years without ever seeing a trout lily. They grow low to the ground and come up in the earliest part of spring, when the weather is still cold and unpredictable. Pushing up from under last year’s leaf pack, they are difficult to spot because the leaves are mottled, like the side of a trout, and the flower is small, delicate, and pale yellow. Trout Lilies are also called dogtooth violets, because the underground bulb of the plant is white and shaped like a dog’s tooth. Depending on the time of day you see them, the flowers may not be open. They close each night, re-open in the morning, and need bright afternoon light to fully open to the reflexed position you will see in some of the photos here. Last year, I discovered a significant patch of trout lilies on a wooded hillside in Blacksburg, Virginia. There were so many trout lilies in this one location, that you could not walk without stepping on them! They appeared in every size, from the smallest seedlings to relatively large, older plants with wide leaves, and tall flowers. From reading about them, I’ve learned that it can take seven years for a single plant to mature. So, finding a colony of them growing in the wild is something to be treasured. 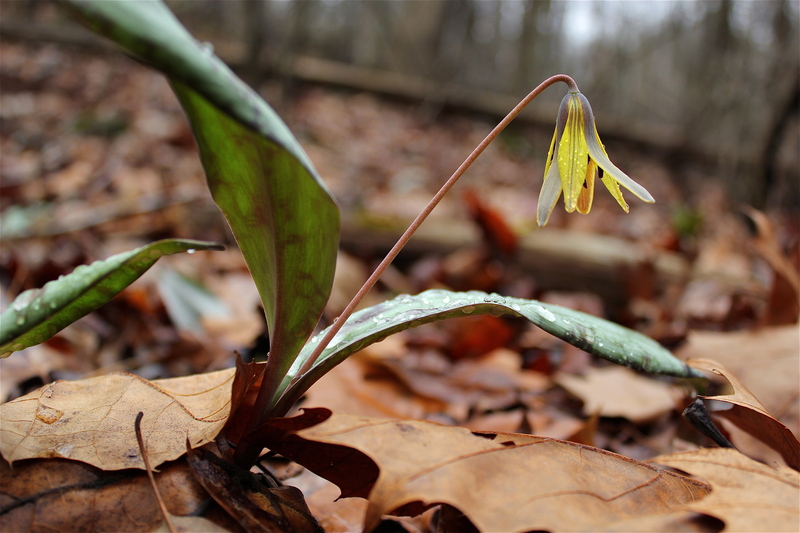 Below is a collection of trout lily photographs taken in March near Blacksburg, VA. The plants come up, flower, and go to seed–all in about three weeks time. These are true springtime ephemerals! A profusion of trout lilies! A hillside of trout lilies! The speckled leaves of trout lily. This one is going to seed. I have just one trout lily on my property: and here it is! Gloria, this blog is totally beautiful. Love it. Thanks for sharing. So happy to see a new post from you! Looking forward to more of them. We relocated to Charlotte nc area and will be exploring pisgah and mount Rogers etc. Beautiful! Have never seen one. Many thanks for posting this. I’ve never seen these. Now I will be looking for them. Thank you! Beautiful post, Gloria. At some point, you need to publish a hard copy collection. Love your photo’s, can’t wait to go hiking to look for early wildflowers. It’s been a long…………..winter. I love your gallery. There were a bunch of them blooming at Douthat State Park the week after Easter and I’m using a photo I took of one of them as my Facebook page main photo. Oh, thanks so much. I really love trout lilies. So delicate, so camouflaged, so easy to miss! There are lots of them growing in the woods behind Dogwood Dell in Richmond’s James River Park System.